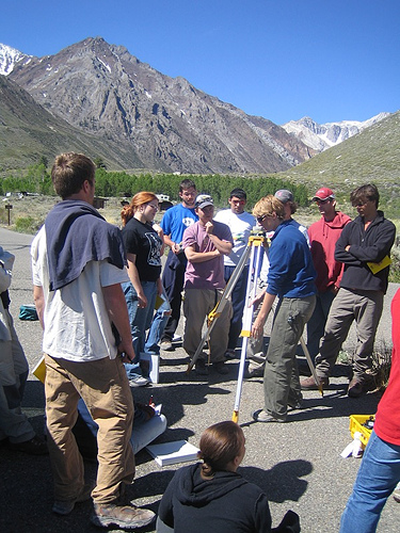 For the second year in a row, UNAVCO provided Indiana University’s “Volcanoes of the Eastern Sierra Nevada: Geology and Natural Heritage of the Long Valley Caldera” field course with a Trimble RTK system to introduce the students to scientific field measurements. The class, led by Dr. Michael Hamburger, is open to students of all majors and offers a hands-on, inquiry-oriented introduction to the geological and ecological setting of one of the most beautiful and environmentally diverse areas of the western U.S. Both years, the class has used the GPS equipment to re-survey a USGS leveling line across the Hilton Creek fault. This year, UNAVCO also provided field support. Field engineer Beth Bartel joined the class for three days, giving informal talks on GPS, volcano geodesy, and professional field experiences, and led the students in GPS surveying in the field. The students also measured the leveling line with spirit leveling techniques to compare the two methods and results. For more information on this course, see our highlight titled “Teaching in Small Groups Gets Big Results for an Introductory Geology Class”. 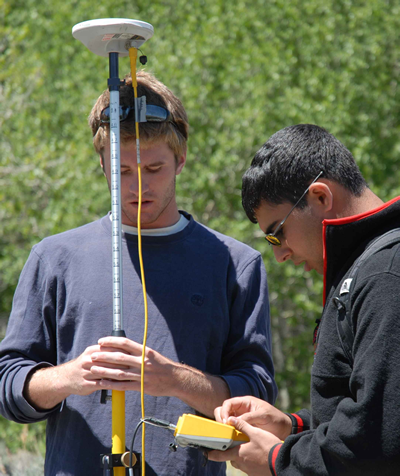 Figure 1 - Students Andrew and Scott measure the position of a leveling marker. Figure 2 - UNAVCO Project Engineer Beth Bartel shows the students how to set up a base station.